I am not a journaler by nature. But I have found that there is something powerful about the process of writing down what I am thinking and reading. 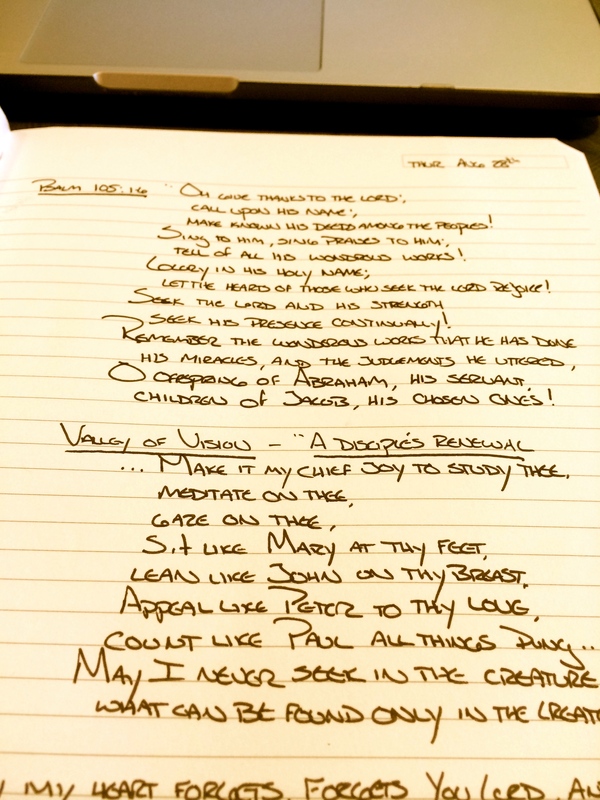 The act of copying scripture down has been wonderful to my heart. It has been convicting and encouraging. I think that through this, I have come to the realization that I understand the depravity of my sinful soul, that I have faith in Christ Jesus and realize that it is through His righteous works, life, death and resurrection that I can receive forgiveness. I realize that I am being constantly convicted of my sin and I seek the Father’s forgiveness. But I have also noticed how little that I stop to do nothing but lift praise to God and to just “be” with Him. I read a prayer that impressed on my heart the desire to enjoy His presence. I want to sit at his feet like Mary did, to lean on his breast like John or to appeal to his love like Peter. But I only come to him when I need something; when I need forgiveness. I long to come to the Lord to lift up praises. I long to come and be marveled by his holiness and I long to be focused only on the Creator and not the creation. Not out of requirement, but out of desire. I pray that my heart would join the heavenly host in unceasing praise. To sing “Holy, holy, holy, is the Lord God Almighty, who was and is and is to come!” day and night. To sing in good times and bad times. To sing during the struggles that accompany support raising. To sing during the tediousness of selling our house. To sing these praises when my truck engine begins to make weird noises. But to also sing these praises when my daughters express their love of their Heavenly Father. To lift praises when supporters join our team. To sing praises when I am forgiven of my sin. The journaling and writing has helped me in this. The dedicated time in sitting, reading, writing and praying have been wonderful. I pray that the Lord will give me the encouragement to continue to seek these wonderful special times with Him.